Break eggs into a bowl and beat lightly with a fork. Stir in sugar, salt, and milk. Heat frypan and coat with a thin layer of butter or margarine. Dip each slice of bread into the egg mix, allowing slices soak for a few seconds. Carefully turn to coat the other side. Soak/coat only as many slices as you will be cooking at one time. Place the soaked bread slices onto the frypan cooking slowly until bottom is golden brown. Turn and brown the other side. 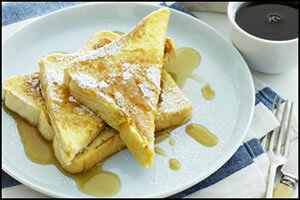 Serve French toast hot with butter and syrup. You can add 1 teaspoon or Vanilla Essence to the Egg mixture. Or sprinkle cinnamon sugar or icing sugar to the cooked French Toast just before serving.